On July 18, 1918 South Africa saw the birth of Nelson Mandela, leader of the struggle against the apartheid. In the centennial since his birth, Sahm Venter, a South African journalist and writer, decided to publish a collection of his letters - The prison letters of Nelson Mandela – written during his detention in Robben Island, then in Pollsmoor, maximum security jail, and finally in the prison of Victor Verster. They are 255 handwritten letters (of which it is possible to see the original layouts) revealing the most intimate and humane trait of Mandela. As a simple prisoner, he expressed what tormented him the most: the way he missed his dear ones. Those letters reveal that even the most righteous cause and the strongest belief cannot avoid the agony of separation. Mandela was allowed only some occasional visits: his wife Winnie could see him only a few times, his daughter only after turning 16. Nonetheless, his letters – which were always checked and often censored by the authorities – are a continuous attempt to keep his bonds with those who were waiting for him outside the jail. Mandela lost much of the life of his dear ones, above all his children. In a letter to his daughter Zenani he wrote soon after her 12th birthday, the future President of South Africa remembered a short visit of the little girl some years earlier. “In a corner, you found my clothes - writes Mandela – You picked them, gave them to me and asked me to come home. You held my hand for so long, pulling me desperately and imploring me to come back”. Those letters remind us of the price of freedom. After his release, Mandela was celebrated by feasts and parades, but all this could not give him back what he had lost: decades of moments, instants, emotions with his young family, which grew up far from him. One of the most touching letters was the one written after the death of his son Thembi in an accident. 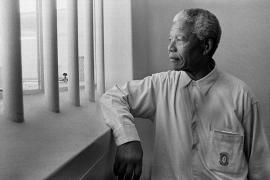 Mandela was not allowed to leave his cell to attend the funeral, and he recalled: “Thembi’s death is a painful experience for us all. This is particularly true for me if you consider that I had not seen him for 5 years, and my request to attend the funeral was not accepted. I will never forget Thembi”. “The Power of Positive Thinking and The Amazing Result of positive thinking, both written by US psychologist Norman Vincent Peale, can be an agreeable reading. The city library should put them at the people’s disposal. I am not giving importance to the metaphysical features of his arguments, but I consider as greatly valuable his vision of the physical and psychological topics. His starting point is that one person’s disease is not so important as his attitude towards it. The man who says “I will defeat this disease and lead a happy life” is already halfway towards victory…This reminds us that hope is a powerful weapon also when everything is lost. You and I, however, have obtained so much over the years and we are harnessing the benefits in many important respects. You are on my mind in every moment of my life”. Again, those letters are a great example of how Mandela always kept together the strength of his beliefs and the respect of his foes. In July 1970, writing to his wife Winnie, he reflected precisely on the behaviour to keep in the public debate on the struggle against the apartheid. “Our cause is right. It is a struggle for human dignity and an honourable life. […] We can be sincere and straightforward without being reckless and offensive, polite without being servile, we can attack racism and its evils without encouraging any feelings of hostility”. “I detest the white supremacy and I will fight against it with all my strength – he then wrote in 1976, in a letter to a police agent – but even when the clash between us becomes the fiercest, I will fight on the basis of principles and ideas, without personal hatred, and at the end of such a struggle, whatever the outcome, I will shake your hand with pride, in sign of morality”. This is maybe one of the most authentic ways to remember Mandela, a hundred years after his death: rediscovering not only the great anti-apartheid hero, but also the father and husband who for decades, like many men and women jailed all over the world, spent his days far from his family, also being denied some fundamental human rights - and he never lost his hope in a fairer and peaceful South Africa and world.